Heavy medieval silence drapes over a Portuguese village built in the 15th century on the banks of the River Duoro. Sun rays bounce off rivers that seem to run through every city in the country. Decorative ceramic tiles line the walls of otherwise simple buildings. This is the Portugal of Jose Saramago. Despite his love of this country, Saramago, the Nobel-Prize-winning writer, had a complicated relationship with his homeland. Portugal is a devoutly religious country, and Saramago was infamous for being a Communist and an atheist. Portugal was opposed to Saramago’s work, so much so that when he published The Gospel According to Jesus Christ in 1991 and was nominated for the European Literary Prize, the Portuguese government banned the book from the competition. The writer moved to Spain. But, in his novels, Saramago captured the people and places of Portugal and, with the recent release of the documentary “Jose and Pilar,” the Portuguese people’s perception of the writer has changed. An intimate look into the life of an endearing and compassionate man, Jose and Pilar ran in theaters for five months in Portugal and was chosen to represent Portugal in the 2012 Academy Awards’ Best Foreign Film and Best Song categories. Saramago won fame in the English-speaking world for his novel Baltasar and Blimunda, a love story set during the Portuguese Inquisition. 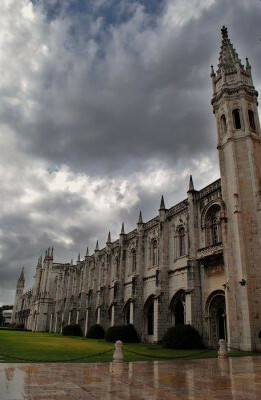 The novel takes place in the convent inside the Mafra National Palace, an enormous neoclassical building in the town of Mafra, about an hour outside Lisbon. 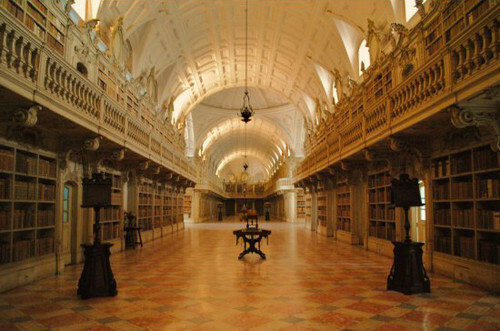 The palace houses a beautiful library with about 40,000 rare books (and, at night, several bats). Forty thousand Portuguese students visit the convent every year after reading Baltasar and Blimunda for a special Saramago tour, which includes a performance of a play based on the novel. “On the walls of that convent you can still sense the suffering that people went through only to fulfill the King’s whims,” said Miguel Gonçalves Mendes, the director of “Jose and Pilar,” who spent four years following Saramago around the world and shot 240 hours worth of footage. Saramago was born in 1922 in the village of Azinhaga, about an hour northeast of Lisbon. Today, the home the author was raised in has been converted to a small museum and bookstore that sells his books in different languages. Outside the museum, a stone figure of Saramago sits on a bench, thinking. A good portion of Saramago’s novel, The Year of the Death of Ricardo Reis, takes place at the Hotel Braganca, where the main character, Ricardo Reis, stays for several months. Today, the newly-renovated hotel has reopened as the LX Boutique, a small, modern establishment near the Tagus River, just a few minutes walk from the bohemian Bairro Alto district. 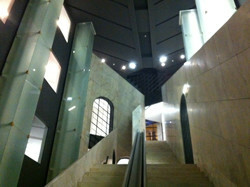 You can sit in the hotel lobby and pretend to be Ricardo Reis, reading the newspaper and watching the passersby. In Saramagos’s novel, The Elephant’s Journey, the elephant lives at the Jeronimos Monastery, a Manueline-style structure in Lisbon that dates back to the 15th century. The monastery is also where Saramago took his second wife, Pilar del Rio, the day they met to see the grave of the Portuguese poet Fernando Pessoa.